27-May-2001 -- From the maps from www.mapquest.com, we only knew that this confluence point is somewhere in Slovenia, between Ljubljana in the east and the Italian border in the west, and that this area is quite mountainous. Since the maps of Slovenia (and also Croatia) from mapquest are not very detailed, we did not know how difficult it would be to reach the point – at least on the mapquest maps it was virtually exactly on a little road in the west of the town Idrija, independent from the zoom factor I chose. Approaching Idrija, the road followed a valley which was becoming deeper and more narrow. For some kilometers the road kept on winding downwards, and finally we reached Idrija – deep in the valley and on some slopes around, surrounded by green high mountains. We knew that we had to change somewhere on a little road to the west, but did not know where the junction was – only few signposts are available. We drove into the center, through narrow streets of cobblestone, and found there a street to Cekovnik. Not bad; at the next junction we took the northern street, which proved to be the correct way. The street led into a valley; and because the town is rather deep down, the very narrow street (sometimes there was not enough space for two cars to pass one another) went up steeply between the houses, and then outside the town still as narrow as before into the side valley. At a bridge over a stream, from where a way forest path branched off, we parked the car (there was actually no other possibility). The good news: the confluence point was only 300 m away. The bad news: in this narrow valley, this meant at least 300 m climbing on the very steep slope. The first part through a forest, then a meadow, and then on some rocks in the forest. On the top (626 m over sea level; the car was parked at 420 m, so the gradient was almost 100%!) there was a path, on which we walked a short way. We expected the point to be somewhere there, but we did not come closer – it did not seem to be up here, but in the direction of a narrow valley next to the path. We went down in this valley – actually a dry stream bed – and were stopped not much later by a rock edge (just 90 m away from the confluence). We had to get around this 10 m high dry waterfall, and this took quite some time, because of the steepness of the terrain, the loose branches and foilage on the ground who made it slippery, and rocks that loosened when hit. Finally, somewhere there in the dry stream, was the confluence. We did not try to fix it as good as possible because of the difficult terrain, we just took some photos, and were happy to climb down back to the car. 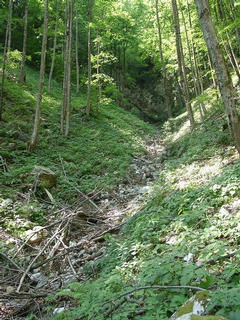 #1: The narrow valley with the dry stream (seen from the East). When there is water, there must be a waterfall over the big rock in the upper part of the picture. #3: Sorry, we didn't locate the point exactly. #4: The upper part of the little valley. The waterfall is behind the edge at which Basti stands. The picture is taken from the opposite side of picture #1. #5: Basti and Michael are climbing down this very steep slope (it took some time). The waterfall is on the right. #6: The house where we reached the street after climbing down. The confluence point is on the slope just behind this house.